The basic difference between President and CEO is that President looks after the internal business operations, the CEO focuses on making a link between internal and external organization. In the corporate world, it is not the products, strategies or advertising, who leads the company in the path of success, rather it is the manpower which makes efforts continuously and strives for organization’s progress. Chief Executive Officer (CEO) and President are two such key persons who hold the top positions in the organization and highly misconstrued. Although, it is important to note that, they differ in their designations, as it brings power, authorities, roles and responsibilities with it. Take a read of the article carefully to know more about the two personalities. Meaning President is the top level officer of the organization who is responsible for day to day operational decisions and implementation of strategies successfully. CEO is the top most person in the organizational hierarchy, who is responsible for the overall vision, strategy, and financial soundness of the organization. President, as the name suggests is the person who presides over an organization. He is the senior most officer of the organization after CEO, who is the head of the branch or division of the company. He is responsible for looking after the day to day business operations and logistics and proper implementation of the organization’s policies as per the directions of the top level executives. Further, depending on the size and nature of the organization, the job responsibilities of a president may differ. The President, leads, guides, directs, and motivates the vice president, managers and other executives of the organization. He is also responsible for the development and implementation of the strategy, maintaining company’s overall performance. He can also present recommendations to the BOD. CEO, an acronym for Chief Executive Officer, is the highest level officer or executive of the organization, who is subordinate only to the company’s Board of Directors (BOD). The BOD fixes the roles, responsibilities, powers and authorities of the CEO, on the basis of the legal structure of the organization. The CEO is responsible for increasing organization’s wealth and making all macro-level decisions, like decisions relating to company’s policy, objectives, strategy, and so forth. He is also responsible for formulation and implementation of the high- level strategy. Further, he can advise and make the recommendation to the BOD on various matters. He is in charge of the overall operations, resources, and performance of the organization. The CEO acts as an interface between the board and the various levels of the company. Chief Executive Officer or CEO is the top most person in the organizational hierarchy, who is responsible for the overall vision, strategy, and financial soundness of the organization. President is the top level officer of the organization who is responsible for management of operations and implementation of strategies successfully. CEO is the senior-most officer of the company. On the other hand, President is subordinate to the Chief Executive Officer. CEO is accountable to the BOD (Board of Directors), whereas CEO is the immediate boss of President. President who has a short-term perspective, as he is responsible for the regular business operations and logistics. As opposed to CEO has a long-term perspective, as he is responsible to formulate company’s vision, mission, goals, and strategies and also forecast company future in the coming years. President concentrates on the maximization of company’s profit while a CEO focuses on wealth maximization that adds to the value to the company. CEO looks after the planning function of the organization, whereas Presidents ensures the systematic implementation of those plans and policies. The President attempts for increasing efficiency, i.e. doing the thing right. Conversely, the Cheif Executive Officer strives for gaining effectiveness, i.e. doing right things. President defines success as the growth of the company but for a CEO, success simply means sustainability. Legacy achieved by the company, is the way to measure, CEO’s work and efforts. On the contrary, the company’s performance is the outcome of the President’s work. 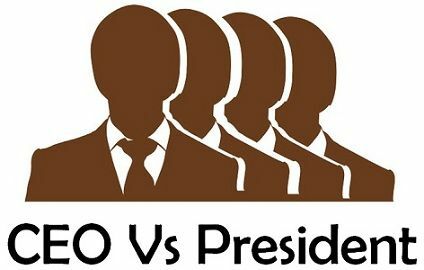 So, with the above discussion, it might be clear that CEO is senior to President and the difference in their roles and responsibilities can be seen in larger organizations. But it is also true that in the case of smaller organizations, the role of CEO and President is performed by a single person. While President focuses on the present, CEO is concentrated towards future.